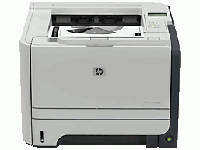 HP LaserJet P2055dn Monochrome Laser Printer has a simple design cuboid. Its surface is almost entirely gray. At the top there is a 150-sheet paper output tray and a control panel. 250-sheet input tray located on the bottom of the printer in which above it can be found an automatic two-sided printing capability.